Is Polymeric Joint Sand Weed Proof? In Northern Illinois one of the biggest complaints from homeowners with brick paver patios is weeds in the joints. 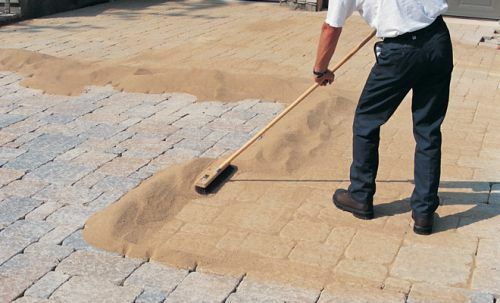 We get daily calls and emails daily from homeowners that have heard of “Polymeric Sand” and that it hardens in the joints and will not allow weeds or insects through the sand and will never wash out. They ask us if the polymeric sand we use is “weed proof”. Unfortunately the answer is no. There’s is no miracle product that will eliminate all weeds, ants and washouts. The good news is Polymeric sand is the best product available to resist the nuisances that come along with the beauty of a paver patio. Polymeric sand is like regular joint sand. It is well graded to include different size particles of sand. It is different because it contains polymers and what most know as portland cement or the fine dust used to give concrete it’s strength. Once wetted the portland and polymers activate to bind the joint sand together. When dry it is hard and when wet is have minimal flexibility. How Weed Resistant is Polymeric Sand? When properly installed polymeric sand is very weed resistant. There are many factors that can lead to early failure of the sand such as not getting sand deep enough into joints, applying too much OR to little water to activate, paver systems that hold too much moisture, hills, and a lot more. The key with polymeric sand and all brick paver surfaces is to keep them clean. When you allow organic material like grass clippings, dirt, mulch etc… to sit in the joints that will break down into an ideal place for a weed seed to get caught p and start growing. The organic material will also keep the polymeric sand wet which will reduce it’s strength and resistance to weeds. Be sure to blow all grass clipping, leafs etc… off the paver patio after cutting grass or on a regular basis. You will also need to hose off the patio occasionally with low pressure. In the freeze thaw climate of Northern Illinois there is a lot of movement in the paver surface. The expansion and contraction will cause joints to open and close slightly and this also leads to the breakdown of polymeric sand. There is no preventing this, it’s just going to happen. The dges of the paver surface is where you will notice the most movement and where weeds will reappear the fastest. Is there anything else I can do to make my brick patio weed resistant? Besides having polymeric sand installed, sealing your brick patio will also help to resist weeds. It will keep the overall surface of your patio cleaner and when the joints are flooded with sealer it gives some extra binding strength to the polymeric sand. The answer to “Is Polymeric Sand Weed Proof” is a definite no. Anybody that tells you it is, and a lot of contractors and manufacturers will tell you it is, doesn’t have the experience with it. Close to 10 years ago when we first starting using it we too had higher hopes for it and were let down. But that’s not to say it isn’t worth it because it is FAR better than regular joint sand and we continue to use it on most jobs. We believe in setting realistic expectations when restoring brick paver patios and driveways. Paver Protector Inc is located in Gilberts, IL and provides Brick Paver Restoration services including Power Washing, Paver Sealing, Joint sanding and Paver Repairs. Our service area includes most of Northern Illinois including Huntley, St. Charles, Geneva, Naperville, Oak Brook, South Barrington, Inverness, Palatine, Batavia, Del Webb Sun City and more. To receive a free estimate use the contact us form or call 630-488-0069.